Show your special someone that you'll forever be linked by presenting her with this beautiful pendant necklace. Features two polished Sterling Silver hearts entwined with each other, with one round-cut Austrian crystal birthstone on each heart. 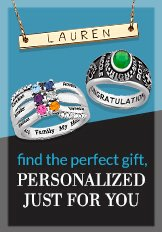 Personalize it by specifying a special date (MMM-DD-YY) and two birthstone colors. Each end of the pendant is suspended from an 18 inch link chain with a spring ring closure. Pendant size is 15x29mm.